Get to know the 45-year old actor, comedian, writer, Stephen Merchant, before he got famous (e.g. The Office). IMDB reports The Fight (TV Movie) was Stephen Merchant's first TV appearance in 2002. In 1999 he starred as James in his first movie Comedy Lab (TV Series) . His home town is Hanham, Avon, England. His parents Jane Elaine (née Hibbs) & Ronald John Merchant are of English ethnicity. 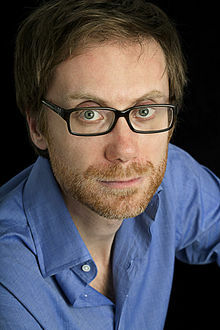 Stephen Merchant was born on November 24, 1974 on a Sunday. Share your real life experiences with Stephen Merchant here and rate your meeting! Correct our wiki/bio - is he not gay or straight or of different heritage? Let us know!